I made the bow at home by straightening a large paperclip, bending it to form an arc, then bending back the ends. I used scissors to snip one end off each of the q-tips. Then I put a rubber band (the kind that comes on the newspaper) onto the "bow." It took Mom a long time to figure out exactly how to shoot it. In the end, Steve captured the gold, Brian took silver and my dad and Kari tied for bronze. My thinking process: "Hmm. Hand. Hand of cards. Ball. Blackball. Handball will be playing a hand of Blackball!" Because it's a long game, we only played the first half then totaled the scores. Timothy took gold, Steve and Kari tied for silver and Brian took bronze. Since Family Olympics would take place on a cruise, it only seemed right to quiz the contestants about the vessel on which they were sailing. I prepared 10 questions about the Grand Princess, using this handy page. The format was inspired by the outstanding Wits and Wagers. The answer to each question is a number. After reading the question, each person writes their guess on an index card. Arrange the index cards in numerical order. After seeing what everyone else has written, each person votes on which answer(s) they think are correct. Points are given to those who correctly choose which answer is closest to the actual answer, regardless of what he/she had written on the index card. Anyone who writes the correct answer on their index card gets points also. Timothy earned his second gold. Steve and Brian tied for silver and Kari took the bronze. For the taekwondo competition, each person had one day to come up with as many 3-8 letter words as they could using the letters in TAEKWONDO. Normal Scrabble rules applied - no contractions, names, foreign words, etc. The scoring was the same as Boggle: 1 point for 3 and 4 letter words, 2 points for 5 letter words, 3 points for 6 letter words, 5 points for 7 letter words, and 11 points for the 8 letter words. I told them there were 211 legitimate words, two of which were 8 letters long. Kari took first place, which wasn't surprising. I was expecting Kari, Mom and Judy to take the top three spots with no problem. Steve (who is terrible with spelling, anagrams, and any sort of word game) shocked us all by coming in second. He spent HOURS, literally writing down every possible combination of letters one by one until he was out of time. Impressive! Judy narrowly beat out Mom for the bronze. On Monday, I'll share the last events from Family Olympics 2016. As I mentioned in my post about the knitting loom beanie, my family returned last Wednesday from a 10-day cruise to Alaska. We traveled with the same group as during our Canada adventure: my parents (Dave and Kathy), my sister (Kari), my brother-in-law (Brian), my nephew (Timothy), my niece (Allison) and Brian's godmother (Judy). I offered to host our 4th annual Family Olympics. "This intense competition will test the physical and mental acuity of each of you. You will be pushed to your athletic and academic limits. You may want to prepare ahead of time through a series of rigorous calisthenics, calculations and calembour. All the details will be revealed to you once you are safely aboard the Grand Princess. In the meantime, you may wish to study the attached scorecard that reveals the twelve events that comprise the 2016 version of the Family Olympics. Best wishes to all. May the odds be ever in your favor." The events were divided into physical competitions (archery, athletics, basketball, boxing, golf and swimming) and mental competitions (artistic gymnastics, handball, rowing, sailing, taekwondo, and weightlifting). I alternated loosely between the two. I ended up cutting the golf competition, leaving a total of 11 events. I'll share four of them today. The actual sport of artistic gymnastics involves things like floor exercise, balance beam, and pommel horse, but our version required decoding the artistic interpretations of the symbols used for each sport in the Rio Olympics. Each contestant got this sheet with instructions to identify each of the sports that will take place in Rio. Give it a try - it's harder than you might think. I gave everyone all day to work on it. They were forbidden from using any outside help, electronics, etc. Some contestants used the strategy of putting the same answer on multiple icons, knowing that one of them would be right. Others filled in the ones they didn't know with wild guesses. Trevor absolutely cracked me up with one of his answers. And I didn't see it until later, but he put 'mixed media' down for the pentathlon. Is he the son of a craft blogger, or what?! Ready to see the answers? How'd you do? Among our 8 contestants, Steve came in first, Timothy was second and Kari was third. There will be 47 gold medals in Athletics in Rio - the most of any sport. It includes all the running, jumping and throwing events. For our competition, we did the shot put. We found an empty corner of a lounge and used cotton balls as shot puts. Here's an action shot from what ended up being Brian's winning toss. Kari came in second. Steve and my dad tied for third. Yet only about a foot separated first and last place. As it turns out, there's only so far that you can put a cotton ball without resorting to 'creative' methods. Kari won this event with a perfect score! Second place went to my dad. Timothy came in third. 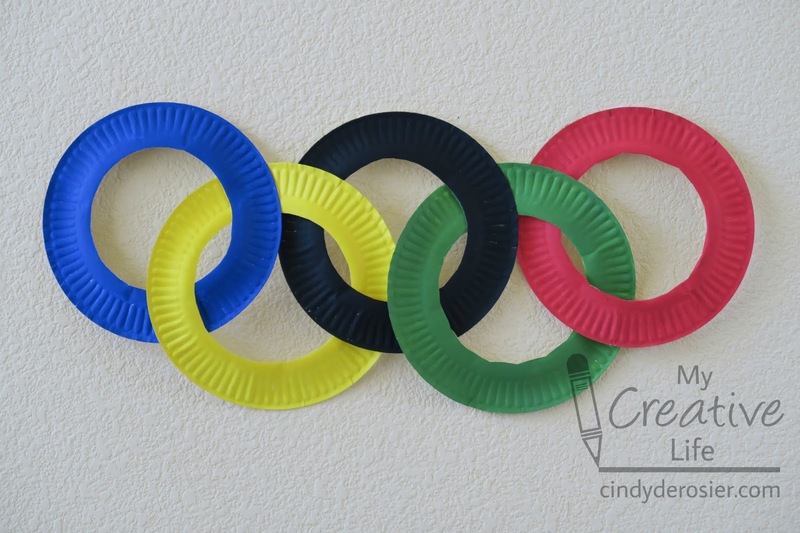 My goal in creating events for the Family Olympics was to minimize the amount of supplies I'd need to bring from home. For the basketball event, I knew there'd be mugs onboard the ship, so I just packed the chipboard numbers. My plan for the Boxing event was to borrow a Jenga set from the game room and time each person to see how long it would take them boxing up the set properly. I was 100% counting on the fact that every cruise ship I've ever been on (and this was cruise #18 for me) has Jenga onboard. Well, as it turns out, they DID have a Jenga set onboard... but there were some blocks missing, the plastic guide was gone, and the box was torn. How can you have a boxing event without a box?! With no better option besides literally having my family box against each other, I ended having them do the opposite of boxing. I timed them building the Jenga set properly rather than boxing it up. My mom won this competition. (The idea of Grandma getting the gold in boxing amused us all.) Second place went to Steve and Kari took third. After the competition was over, Trevor and Allison used the Jenga blocks as dominoes and played for a long time. I'll share more from our Family Olympics tomorrow! Disclosure: This post has affiliate links. If you make a purchase using the link, I will get a portion at no extra cost to you. Thanks for your support! I just finished my latest article for Little Passports and realized I haven't mentioned here that I'm now a paid blogger for Little Passports! As Trevor and I are making our way back through each state, I'm taking photos and writing about our adventures. I'm literally getting paid for doing crafts, cooking and science with my son and blogging about it. Pinch me! The latest article was about Hawaii. It was fun to go back and reread everything in the Hawaii Journal. 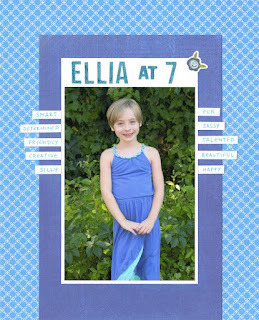 Each Journal is packed with activities and information. As Trevor is getting older, he's getting even more out of each Journal. He's making connections and comparisons among the states. It's especially neat when he recognizes places in the Journal that he has been. Trevor has been to Hawaii twice, at age 3 and age 7. He doesn't remember the first trip at all and has incomplete memories of the more recent trip, so it's been awesome to be able to pull out the scrapbook and show him photos of him at the same places that are mentioned in the Journal. In addition to the fun word search, hidden picture, dot-to-dot and other puzzles, we did all the hands-on activities too. We made origami whales. 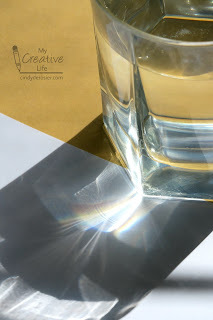 We learned how to make a rainbow with a glass of water by placing it between sunlight and a piece of white paper. 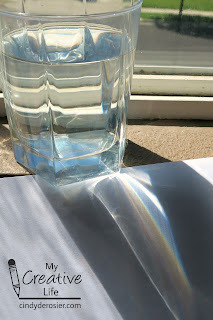 We tested a bunch of different variables, such as the amount of water in the glass, the shape of the glass, the angle of the paper, and more to see how they affected the rainbow. Give it a try! Finally, Trevor made Hawaiian Sweet Bread with his cousin, Allison. Such concentration on both of their faces! Their efforts were well worth it, as the bread was really yummy. We'll definitely be making this again. Another super fun adventure with Little Passports! My goddaughter Ellia will always be special to me for many reasons, among them that I was privileged to be there at her birth seven years ago. There's no one else in the world who can say that! Well, except Trevor, I suppose. He's pretty special to me, too. Obviously, I took my color inspiration from her cute two-tone dress. The page came together so quickly and easily. Scrapping is easy when you have a great photo of a beautiful girl as the subject! As always, I waited until after this year's page was done to look back at the previous years (which you can see here and here). I love seeing how my descriptions of her have changed as she's grown. It's fun to see the changes in my scrapbooking skills as well! 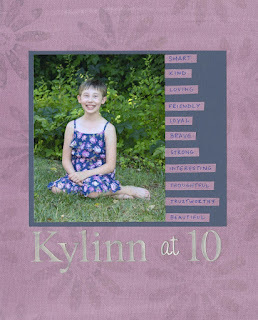 After ten years, it's not exactly a surprise when I give my goddaughter Kylinn a framed scrapbook page for her birthday. But she's always SO excited to see the color scheme and the words I choose to describe her. I just love her enthusiasm! 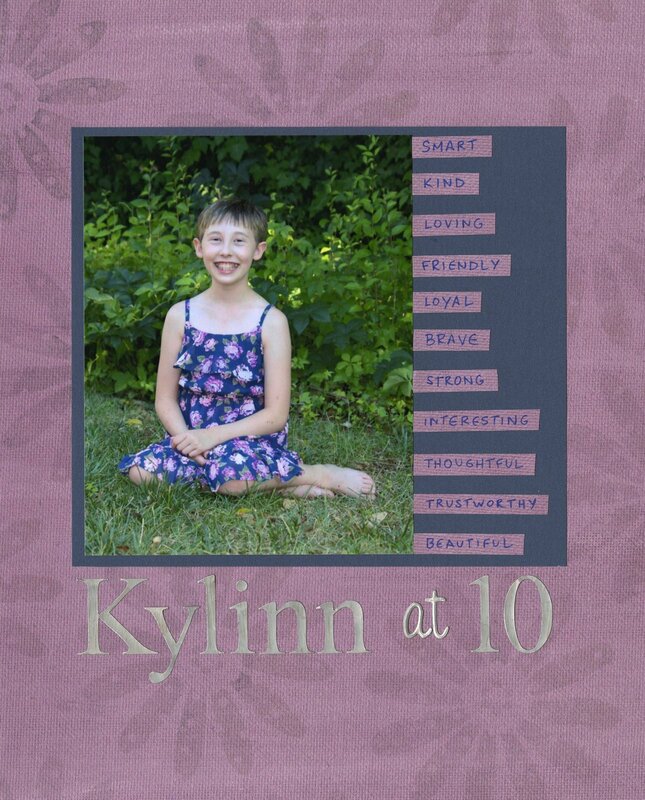 You can see Kylinn's nine other birthday layouts here and here. Ten years old. Where has the time gone?! This beanie is my very first ever knitting project. With as many crafts as I do, people are often surprised to hear that I'd never done any knit or crochet projects. A mom friend tried to teach me to knit over several different sessions about five years ago, but between my being left-handed and our kids interrupting us every 30 seconds, I didn't actually learn. Veronica told me that the Oval Knitting Loom was also very kid-friendly. I was interested, but hesitant. Would I be able to do it, or was I setting myself up to fail? Did it matter that I was left-handed? Is this something Trevor would enjoy? I thought about it, then emailed my reply to Veronica: "I'd like to try. If it's REALLY easy enough for a true beginner, sign me up." About a week later, the Oval Loom Knitting Set showed up at my door. I'd met Veronica at the FaveCrafts Blogger Networking Event back in January. At the same event, I met Sandi from Premier Yarns. I contacted her to tell her I'd be reviewing the Oval Loom Knitting Set and asked if she could provide me with some appropriate yarn. She happily agreed and sent me some beautiful skeins. Thank you! When the yarn arrived, Trevor and I opened the knitting loom and read carefully through the instructions for the first (easiest) project, the beanie. We decided to use the larger loom to make an adult-sized beanie. Trevor selected the azure Deborah Norville Everyday Soft Worsted Yarn. It's so pretty! Finally, it was time to dive in. Fortunately, the directions were very easy to follow. The book has large, clear illustrations, as well as handy icons that show which steps have an online video tutorial. Within 15 minutes, Trevor had done the first few rows. Basically, all you do is wrap the yarn around the pegs, then use the tool to lift each loop over the next. That's all there is to it. I did a few rows, then we set it aside for the day. I love that there's no problem with just setting it down. The final step to make the beanie was to remove it from the loom and shape it. We were really excited to be so close to the end and happily flipped to the directions to see what to do. Then... uh oh. The directions say to use a yarn needle to remove the project, but the kit does not include a yarn needle. I don't expect the kit to include EVERYTHING you need to make a project; for example, it's totally reasonable for the yarn to be sold separately and for crafters to use the scissors they already own to cut the yarn. But a yarn needle isn't something beginners are likely to have on hand. That's my only criticism of an otherwise excellent product. Once we found a yarn needle, finishing up the hat took just a few minutes. So exciting! Here I am wearing it during our family cruise to Alaska. We got home on Wednesday. See the icebergs in the water behind me? This was taken in Endicott Arm, partway to Dawes Glacier. I stayed toasty warm with my new hat. I'm looking forward to trying another project. Thanks again to Leisure Arts and Premier Yarns for providing me with the materials! I've been a member of the Craft and Hobby Association (CHA) since December 2014. My annual membership fee ($160) has paid for itself over and over in the value I've gotten since becoming a member. Obviously, there's the annual Mega Show. Did you know that members attend the show for free? Transportation and hotel add up quickly, but the conference itself doesn't cost anything. Even if I got nothing else out of my CHA membership, it'd be worth it for the Mega Show. But CHA membership has even more perks! There are savings on business-related services like UPS, Hootsuite, Staples, and Avis, just to name a few. Members get a subscription to Craft Industry Today magazine. There are frequent webinars and workshops for members that have been very informative and helpful. We have access to so many resources within the industry. Most of all, we have each other. My fellow CHA members are so incredibly supportive and helpful. Crafters really are some of the nicest people. With any organization, what you get out of it is directly related to what you put in. For that reason, I've attended everything I can attend and volunteered for everything that needed volunteers. I'm now the kids' crafts representative on the CHA Trends Committee, which basically entails researching and writing about trends in the crafts marketed toward kids. I'm helping out with the Social Committee by welcoming CHA new members and answering questions for prospective members. 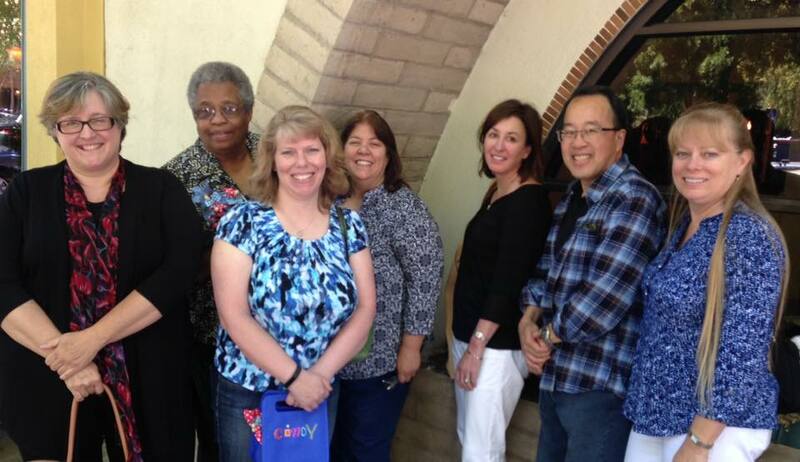 And I'm on the leadership team for the newly formed Northern California Chapter of CHA. 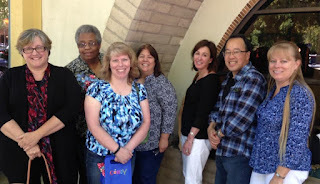 We held our first NoCal Chapter Meeting in June. There were seven of us at this inaugural event. We had a great time getting to know each other, talking about our hopes for the Chapter, and planning a big event for October. .... and chopped it into six pieces. I kept the piece with the face for myself and put the remaining five pieces into ziplock bags with my business card. 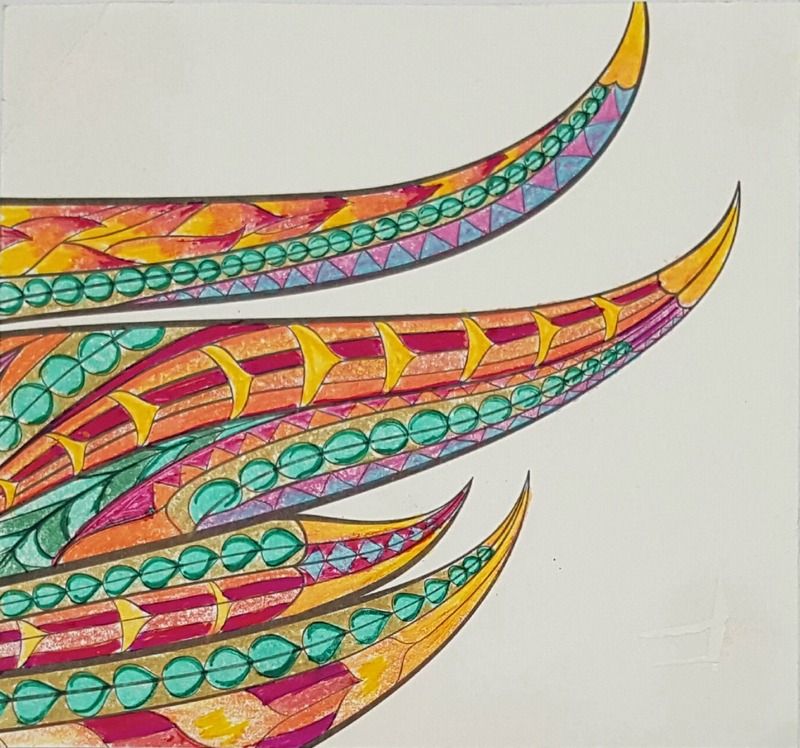 At the event, I explained that I'd like five volunteers to color a piece of the design using any media and then scan it and send it to me. I did not tell them what the completed design was, nor give them any further guidelines. Susan McGarry is a talented glass artist. 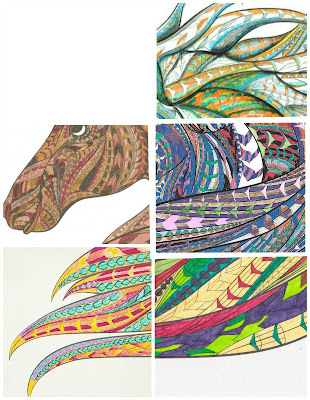 You can see her work at Artifill.com. And, as it turns out, she lives walking distance from me! If not for our NoCal CHA Chapter, I might never have known there was a CHA member living practically down the street. 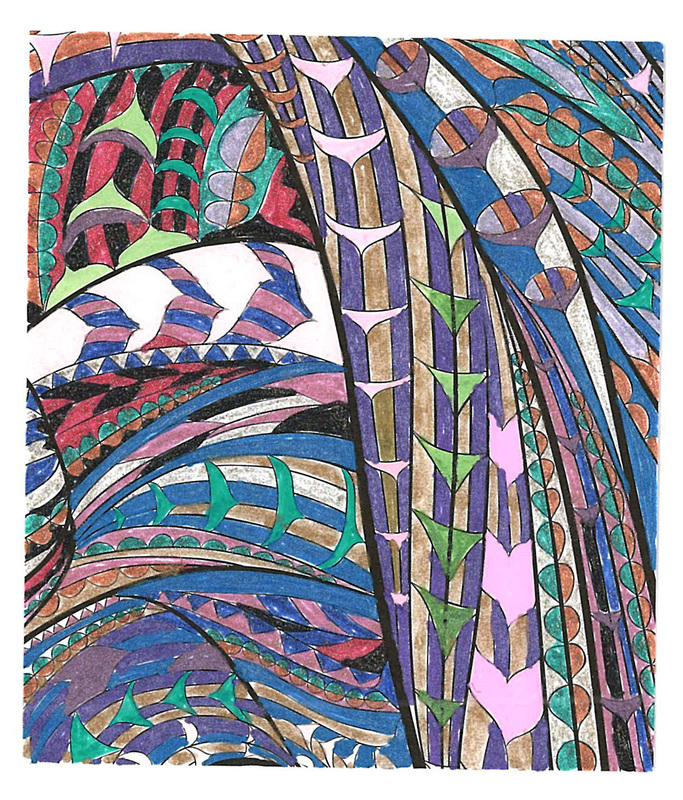 Susan colored her piece with colored pencils and gel pens. Lisa Fulmer is a designer, author, teacher AND marketing consultant. You can see her crafts at lisalizalou.com. 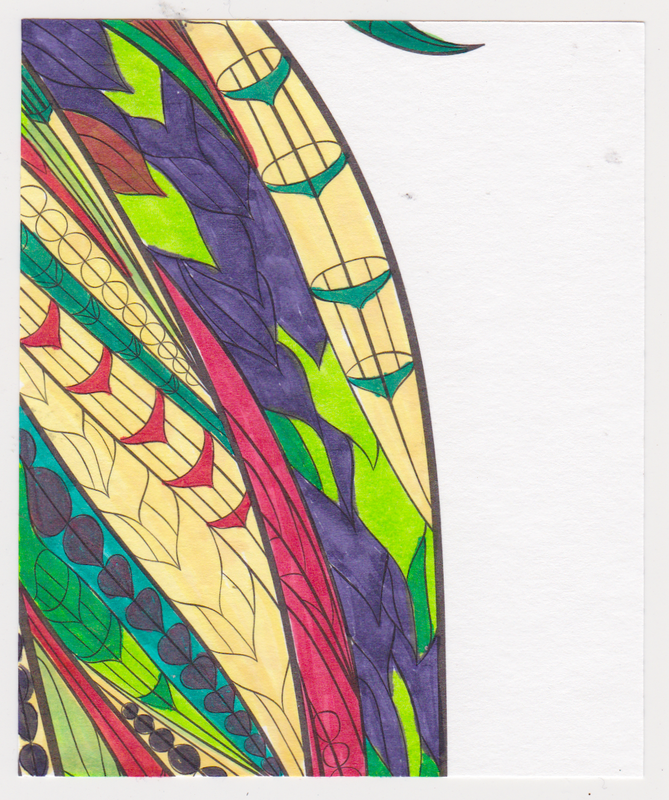 She colored her piece with Copic markers. Kirsten Malone owns Twenty Stitches. 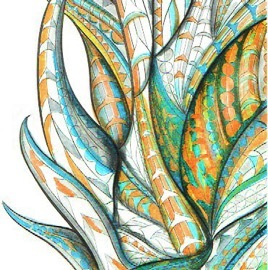 She used Faber Castell artists pens to color her piece. Peter Ouyang is the V.P. of Product Development & Marketing for Sakura of America. 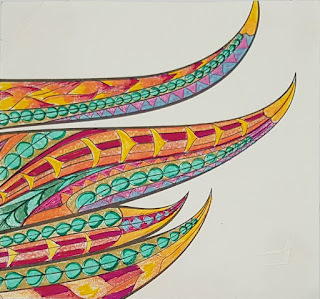 He colored his piece with Sakura Gelly Roll pens. 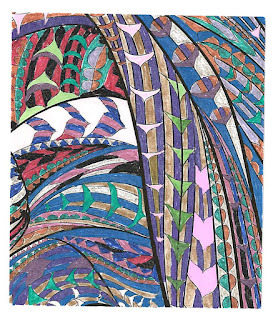 Gloria Robertson colored a piece as well, but between her travels and technical difficulties with scanning, she hasn't been able to get her artwork to me. My piece is the one that gives away the design. 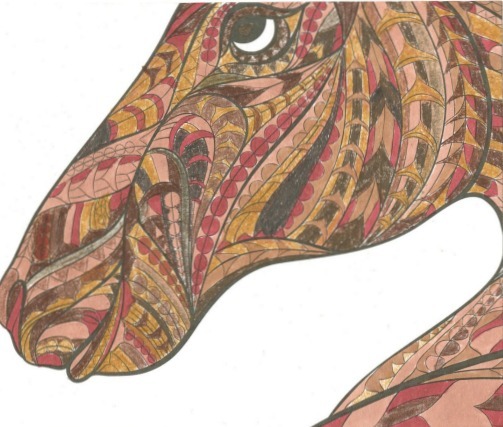 Did any of you guess it was a horse?! I used Prismacolor art markers and Prang, Crayola and Prismacolor colored pencils. Ready to see the (almost) complete image? It's so neat seeing the pieces come together. If/when I get Gloria's piece, I'll update the collage. Thanks again to Leisure Arts for providing me with this gorgeous coloring book! 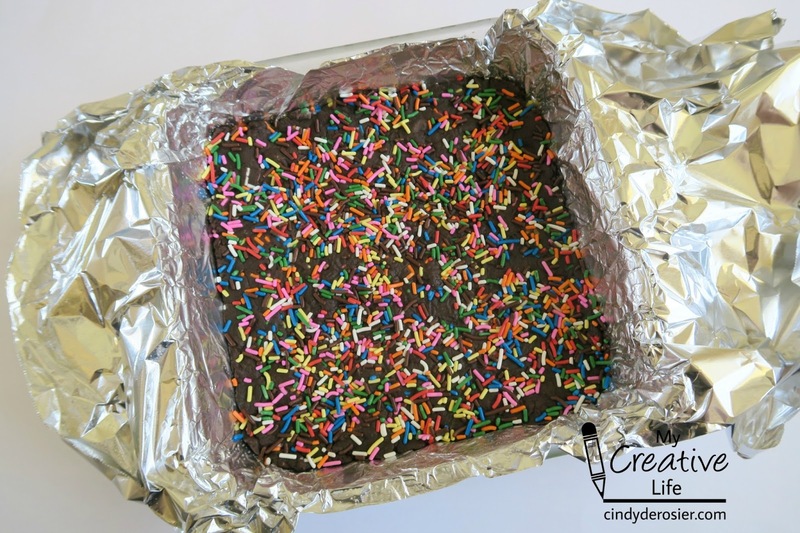 Steve needed to bring a potluck item to a Cub Scout committee meeting. I finished watching another batch of lessons from the outstanding Food Photography class I'm taking (affiliate link) and was anxious to do another photo shoot. Trevor had a friend over for a 6-hour playdate. 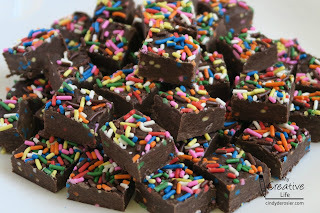 I saw a recipe for a version of cake mix fudge for the zillionth time. There are tons of different recipes out there for cake mix fudge and I've always wondered if it is actually any good. This seemed like the perfect time to try it out. 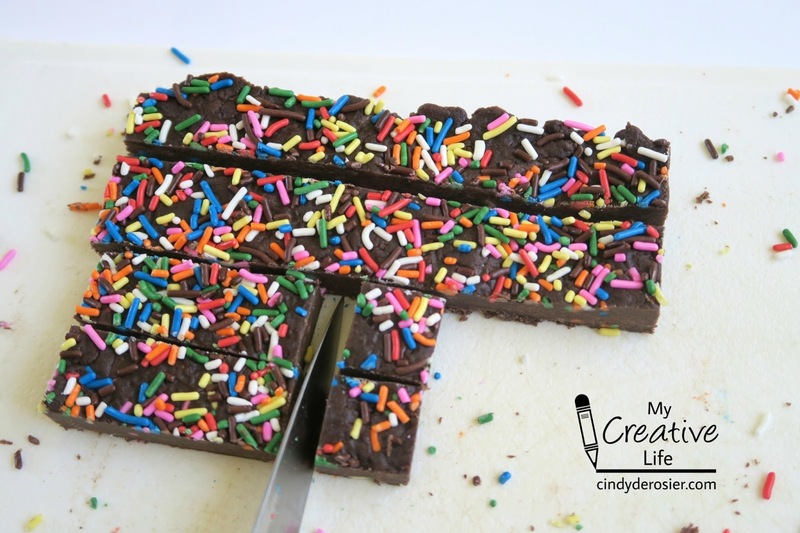 I chose this chocolate cake batter fudge recipe from Vanessa Baked and let the kids loose. They did a really good job of working together. 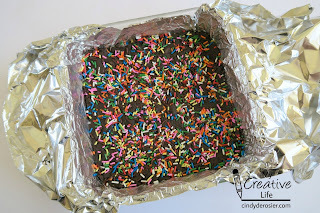 I like how kid-friendly this recipe is. 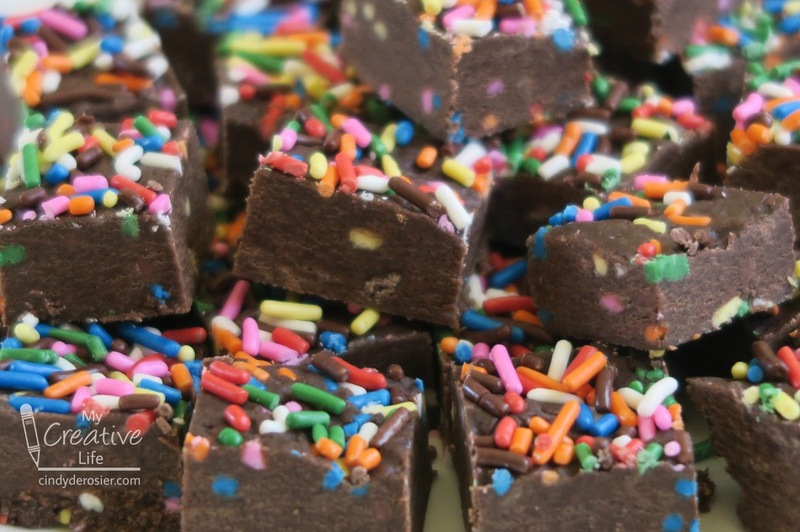 The only heat source is the microwave, so I didn't have to worry about them using the stovetop like when making traditional fudge. 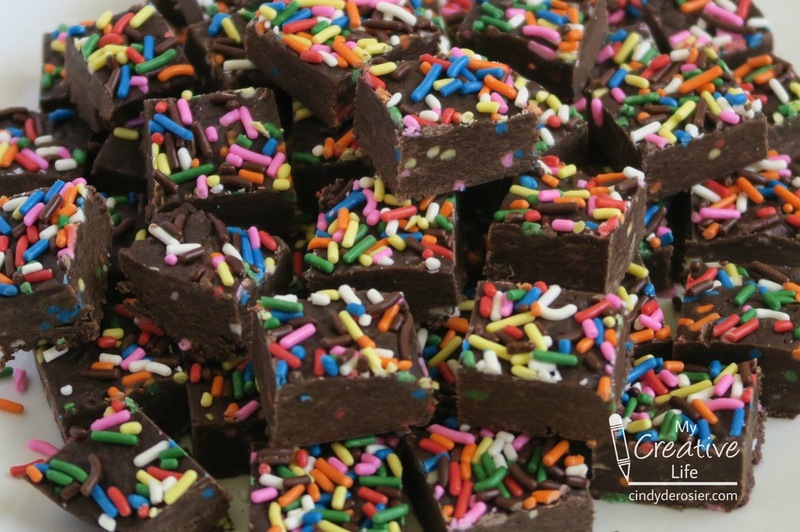 The instructions call for putting the fudge into a foil-wrapped dish and refrigerating until it is firm. Not surprisingly, the kids weren't crazy about having to wait. 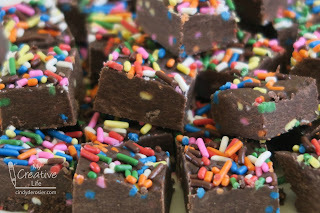 And then I made matters worse by taking the finished fudge into the dining room (the best light in the house) and photographing it instead of immediately serving them! 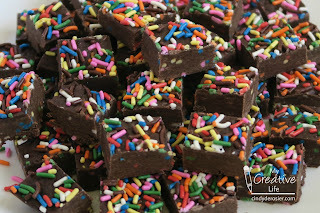 Since they were clearly going to explode if they didn't get fudge stat, I cut some pieces and let them at it. Then I returned to the dining room for more photos. Some of my favorite lessons from Andrew Scrivani's class have been about propping and styling. I don't think I've ever taken an action shot of myself cutting, so that was fun to try. Then I put down the knife to see what that would look like. Again, it's not a photo I would ever have thought to take, but I'm happy with it. I like that it shows the brand of knife I use and the fact that I'm left handed. 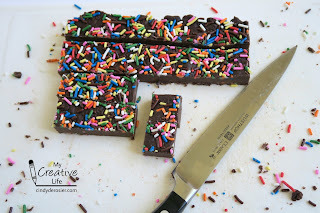 I like the mess of sprinkles around the cutting board. I tried some close-ups next. And then I backed out slightly to get this shot and the leading image. As before, these photos are not processed except for some cropping and, obviously, adding the watermark. While they have plenty of technical flaws, I think the composition is interesting and together they make a more complete story than my food photography used to do. Check out this and all the other amazing classes that CreativeLive has to offer!